In this post we are going to talk about the different types of grass seed. It is very important to choose the right match for your specific environment and also for when you are putting the seed down. Many bags of store seed you will purchase will be a blend of these, either all three types or perhaps just two. The differences between the three types are germination period, traffic tolerance and whether they will grow in the sun or shade. The color is another difference but this is hardly a choice. Everyone wants a deep rich lawn, but you cannot choose a grass seed based on color. It has to fit the actual living environment and not just a great looking picture. So, let’s go through each type and identify which one is best for you. Kentucky Bluegrass is a cool season grass and is often considered the king of grasses. It has a great looking, rich green color. It goes dormant in the summer months which makes it grow really well in the sun. Bluegrass continues to grow and expand as it is cut, so it naturally fills in the bare spots. It is often used on athletic fields and and golf courses because of the color and ability to withstand full sun. It tends to be more expensive and requires several weeks to germinate so it needs to be planted early in the fall. requires less water and fertilizer, so it does well in the sun. The finefescue tolerates dry and shady conditions, but do not do well with alot of traffic. The fescue type will also fill in bare spots as it is cut, just like the bluegrass. When purchasing a shady blend there should be a higher percentage of fescue. 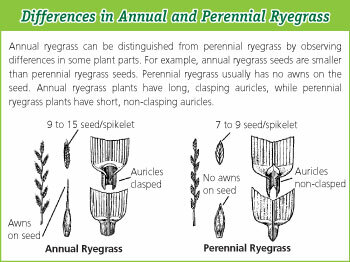 Ryegrass is a third type. It has a quick germination period, especially the annual ryegrass. It comes up quick but also dies with the first frost. A perennial type will also come in pretty quick and comes back every year. A ryegra ss will not fill in the bare areas and basically grow vertical and stay where it is. They don’t have the underground roots that expand. The ryegrass is also tolerant to many insects as well, like chinchbugs. A blend of seed is typically what you will looking for. The front label will tell you sun, shade or both. 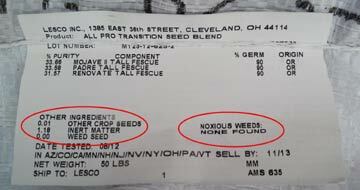 But turn the bag over and read the label to see the mix of seed that is in there. Some of the newer products have a coating or additional products in there that is not seed. I typically recommend staying away from those because there is less seed in the bag, and more ‘filler’, including weeds. 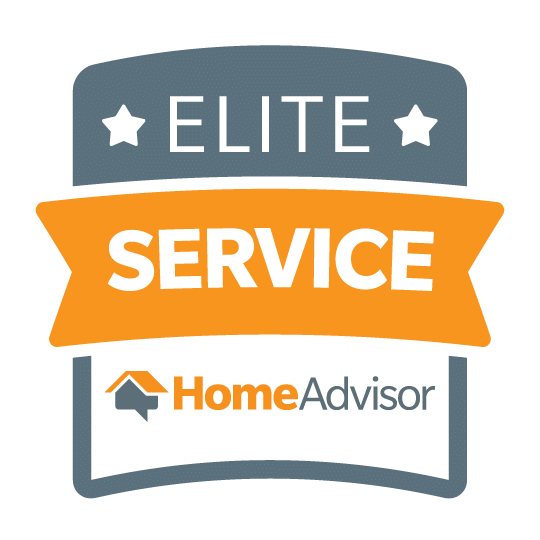 They are designed to make it easier for the homeowner to care for because it requires less water. But you will pay more for less seed. 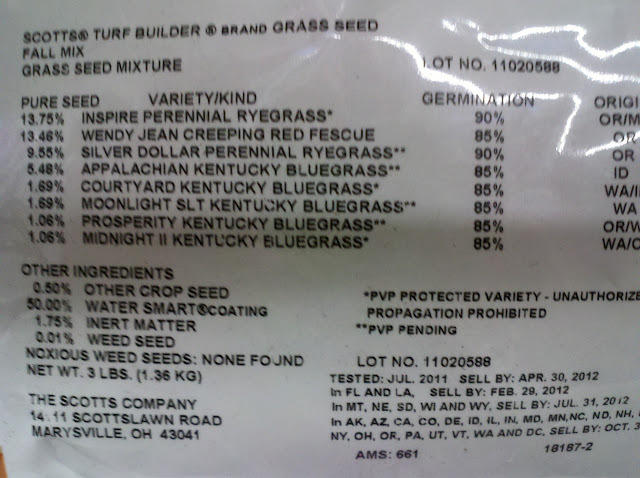 So look at the label and a good mix will be close to 100% grass seed. Take a look at the two labels below. A sun blend will have a good amount of kentucky bluegrass, while a shade mix will have a lot of the fine fescue. Even with the shade mix though, it still needs sun to finish the photosynthesis process. If you are trying to seed an area that never sees the sun, than you will have to come up with a different game plan, perhaps mulch or some type of ground cover. The label on top is a Scott’s product, take a look at the bottom of the label and see the watersmart coating. Over half of that bag is not even grass seed. The label below is a lesco product that is pure grass seed, close to 100%. It requires more attention and more watering, but you will more grass popping up in a couple weeks.